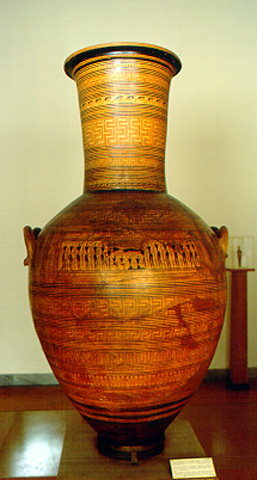 Geometric amphora from the Dipylon. The band in the height of the handles includes a metope with the main scene of the prothesis of the deceased (laying out of the dead on a couch). The vase was used as a funerary monument at the Dipylon of Kerameikos, in Athens, and it is the work of the "Dipylon painter". Dated to the middle of the 8th century B.C. Inv. no. 804.